We recently asked our followers about one piece of advice they would give to someone who is moving house with a cat. 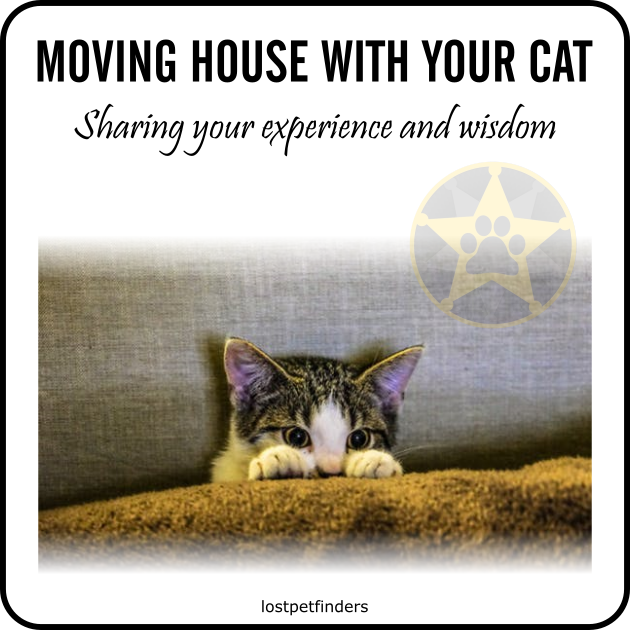 We all know that the process of moving house can be very stressful for territorial animals resulting in increased risk of them going missing. “Moving house with your cat” guide. CATTERY ACCOMMODATION. If you can afford it, place your cat with a cattery for a few days while moving. “3-4 days prior to moving leave [your cats’] carriers out for them to get accustomed to. On the day of moving, keep them in a room that won’t be accessed until you finally go. Put them in carriers and take to new home. DO NOT LET THEM OUT YET! Put them in a room that won’t be accessed while shifting furniture. Shut the door and leave them in the room in their carriers until all removalists have left. The cats can be let out of their carriers now but DO NOT LET THEM OUT OF THIS ROOM. Let them become accustomed to this room and its smells over 2-3 days. This gives them time to regain confidence after moving from their old home. TAKE TIME TO ADJUST. So many of you have emphasised the importance of giving your cat enough time to get used to the indoors first by keeping them in for at least 2 weeks before allowing them to explore the outdoors. BRING FAMILIAR THINGS. Bring to your new house as many things from the old house as you can. PLENTY OF TLC. And of course don’t forget to give them love and attention throughout the ordeal. UPDATE PERSONAL DETAILS. And last but definitely not least, make sure everything is updated with your new details. Did we miss anything? Tell us in the comments. Once again, a heartfelt thank you to everyone for your insightful input in creating this “Moving house with your cat” guide.